In late November 1968, The Beatles released the double album usually referred to as the White Album. USC running back OJ Simpson was awarded the Heisman Trophy. And on San Francisco’s Top 40 KFRC, it was an incredible week for lots of songs that would stand the test of time. Bubbling under and entering the chart at #30 (on its way to becoming a #5 hit nationally in early 1969) was B.J. Thomas‘ terrific “Hooked on a Feeling.” What a great vocal! Canned Heat‘s “Going Up the Country” began its run at #26. (We told you this was a great week…) The blues-rock band would earn their highest-charting hit at #11. This is crazy: Joe Cocker‘s cover of “With a Little Help From My Friends” jumped this week from #19 to #15. But KFRC was way ahead of everyone else: despite the song going to #1 in the U.K., it would stall in the U.S. at #68. That certainly didn’t prevent him from earning a signature moment at Woodstock in August 1969. Leaping to #11 (from #22) was Marvin Gaye‘s “I Heard it Through the Grapevine,” which would become the first of his three #1 pop hits. Onto the Top 10: at #8 was Steppenwolf’s “Magic Carpet Ride.” Earlier in the year, the hard rock group had scored a #2 hit with “Born To Be Wild.” They quickly followed it up with another amazing song that truly helped define the era and whose lyrics were filled with wild imagery. To wit: “Why don’t you tell your dreams to me/Fantasy will set you free.” Far freakin’ out and a crime it didn’t reach #1, peaking at #3. 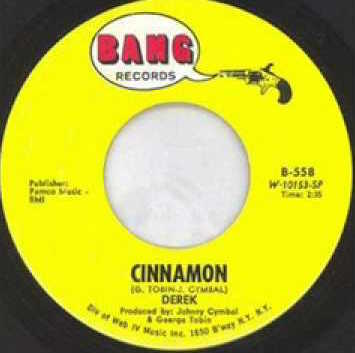 Raise your hand if you’ve heard the #7 song “Cinnamon” lately, which was credited to “Derek.” The performer was, in fact, a singer, songwriter and producer named Johnny Cymbal (which itself was a stage name for John Blair). Confused? Well, we are too. Want more? Johnny’s brother’s actual name was Derek. A good song regardless of who sang it. By November 1968, Stevie Wonder was earning his 18th Hot 100 hit of his career at – get this – the age of only 18 with “For Once In My Life.” It was #4 this week on its way to #2 nationally. Here’s another example of how radio audiences and radio station programmers differ throughout the country: while Creedence Clearwater Revival’s cover of the Screamin’ Jay Hawkins’ 1956 composition “I Put A Spell On You” was at #3 in San Francisco this week, the song only peaked at #58 nationally. Judy Collins recorded Joni Mitchell’s “Both Sides, Now” in 1967. It was released as a single in October 1968 and her gorgeous rendition became the highest charting single of her career, reaching #8 on the Hot 100, her only Top 10 chart hit. At #1? Glen Campbell’s “Wichita Lineman,” one of many Jimmy Webb compositions that the singer recorded. (Others prominently include “Galveston” and “By The Time I Get To Phoenix.”) Though “Lineman” would only reach #3 on the Hot 100, it topped the Country and Adult Contemporary charts. While I always enjoy reading these articles, I must point out something that is extremely inaccurate (historical). Nixon was not President in November 1968, but he was elected then (first time), so there is no way there could be an 18 1/2 minute gap in the White House Tapes when he wasn’t even in office yet. Thanks for pointing that out! Due to an editing error, the setup included some events from November 1973. Richard Nixon wasn’t elected President until November 1968. The famous “I am not a crook” quote came after Watergate (1972). Believe me…I am old enough to remember!